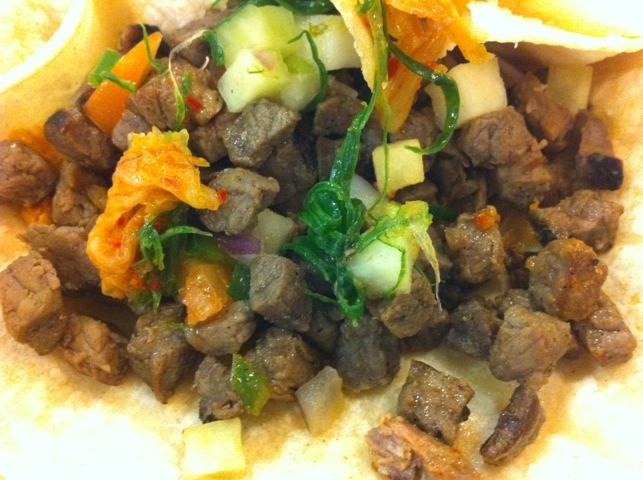 The beef taco from Kimchi Taco Truck. 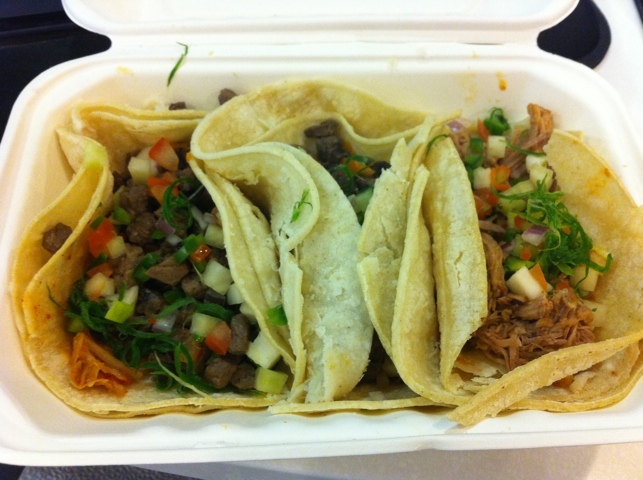 If you’re a longtime reader of this blog, you’ll know I have a deep affection for Korean BBQ and in particular Korean tacos. It’s a genius fusion of styles, in my opinion. 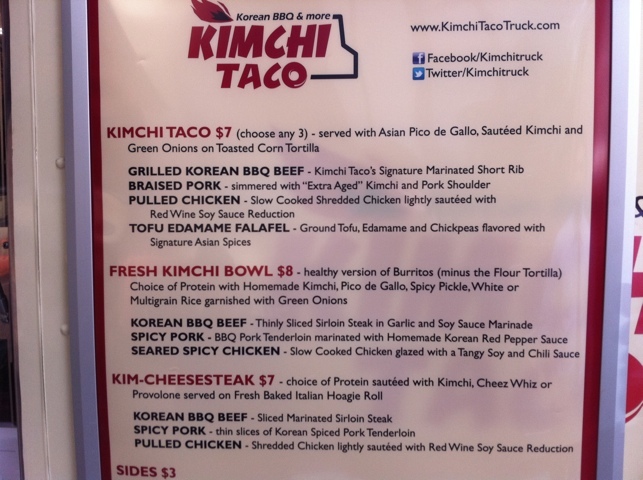 The other day I got to sample the latest entrant to the field, the Kimchi Taco truck. The line was long, but moved quickly. I’m not the only one wise to this craze. 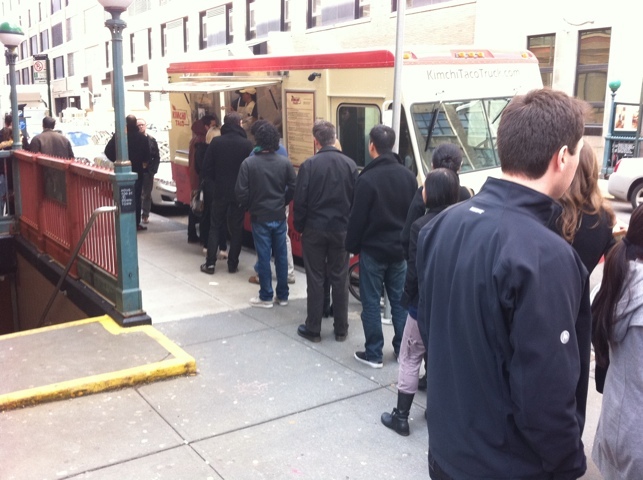 The line for the truck was among the longest I’ve seen, even during the busy height of lunch hour. Though the line was long, it moved fairly quickly. I was able to make my order after 15 minutes and pick it up just a few minutes later. The menu looks awesome. I'd like to try them all... . Since it was my fist time at the truck, I opted for the tacos, although the other items on the menu sound pretty spectacular. They have something on the menu called a Kim-cheesesteak which sounds incredibly brilliant to me. Who would think of fusing Korean kimchi flavor with cheez whiz and a roll? I will be trying that. I guess it is because the operators of the truck have Philadelphia roots. What you get for $7. Pretty impressive. You get 3 tacos for $7, which is a terrific deal all in all. I opted for two beef and one pork. Notice the shape of the pieces of beef. The beef is prepared in small cubes. That was unfortunate, in my opinion, because the cubes were just a bit tough. I found that style of preparation got in the way, and wondered why they didn’t go with ropier slabs, like Bapcha. 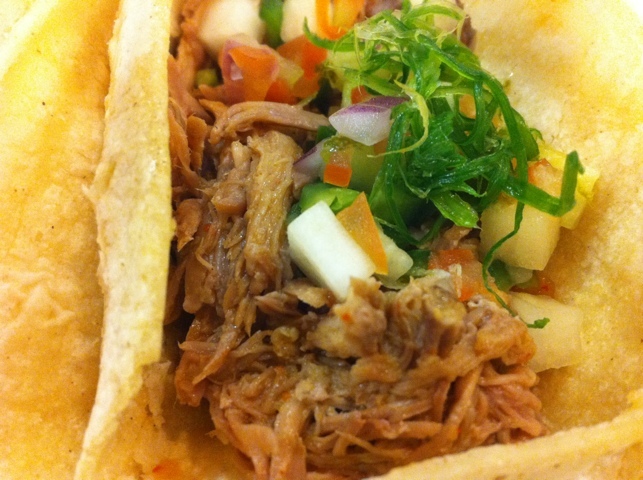 The pork however was shredded, making it much easier to munch on in taco form. I preferred it to the beef. 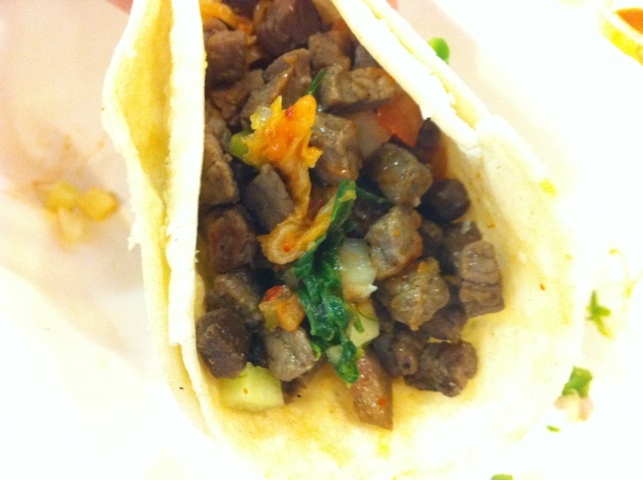 The beef tacos had a slightly fuller, rounder flavor than the pork taco, which naturally was a bit sweeter. Biting into the taco. Asian pico de gallo and kimchi atop the pork. As far as flavor goes, though, the kimchi atop the protein is the real star. Kimchi is fermented veggies and packs a distinct flavor. The taco truck’s chef Youngsun Lee ferments his own for months with pepper flakes from his grandmother’s farm in Korea. 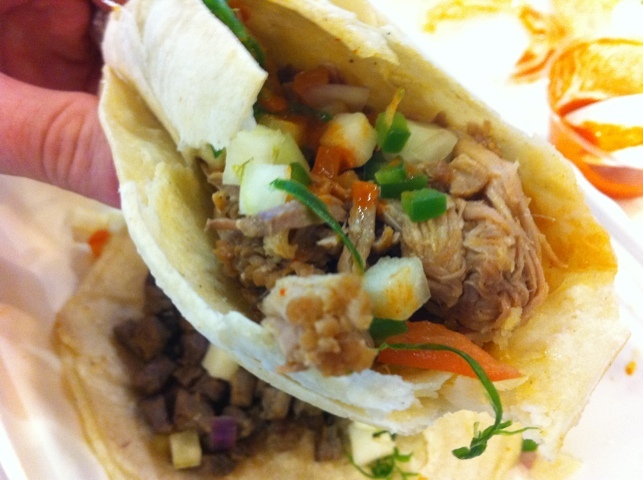 The tacos are served with a piece of pickled cabbage and that and the kimchi flavor just overwhelms the beef and pork. It’s dominant, but in a great way. The cabbage itself is expertly done, crispy, crunchy and flavorful. The pico de gallo adds a fresh zest to the experience. The double tacos add a starch. I got the side of spicy sauce, which added heat but wasn’t thermonuclear. Thoughtfully, the owners also give you a wet-nap to clean up with. All in all, I definitely enjoyed myself and think there’s a lot of bang for the buck here. It’s a much better bargain than Calexico, for example. I am eager though to try the Kim-cheesesteak, which is what I will get when I return.